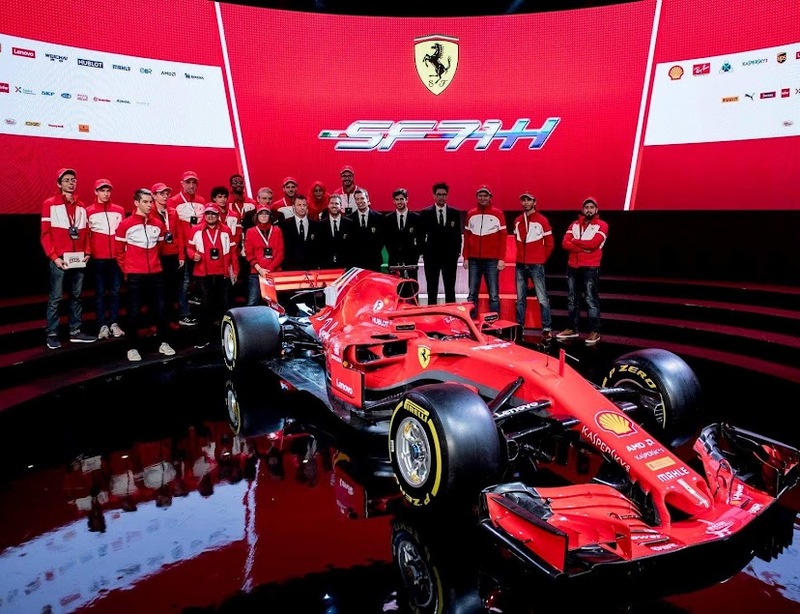 In love with Formula 1: Brazil GP: Sensational victory for Sebastian! Me and my Finnish Formula 1 friend Heli Vepsäläinen at C More F1 studio with the Finnish F1 team: Tomi Tuominen, Toni Vilander and Ossi Oikarinen. My bet on the top three: Vettel 1st, Verstappen 2nd and Bottas 3rd. I had an exceptional race Sunday. I was still in hospital with my son, who was treated there because of an infection. 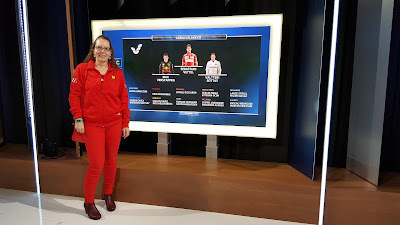 However, my sister had arranged me a belated birthday surprise, a chance to visit the Finnish C More F1 studio in Helsinki! 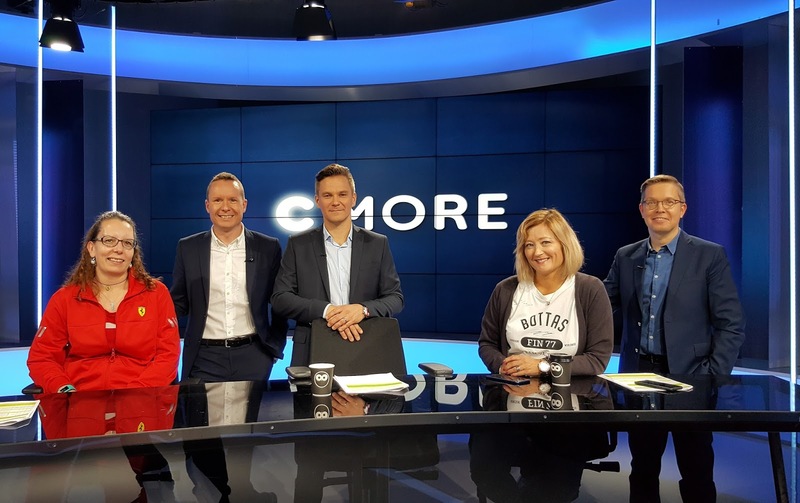 I was allowed to ask a friend to join me, so I went to the studio with Heli Vepsäläinen, whom I had met a few months earlier at the Santander event in Helsinki. We share the devoted passion for Formula 1 racing, so it was fantastic to meet her again. 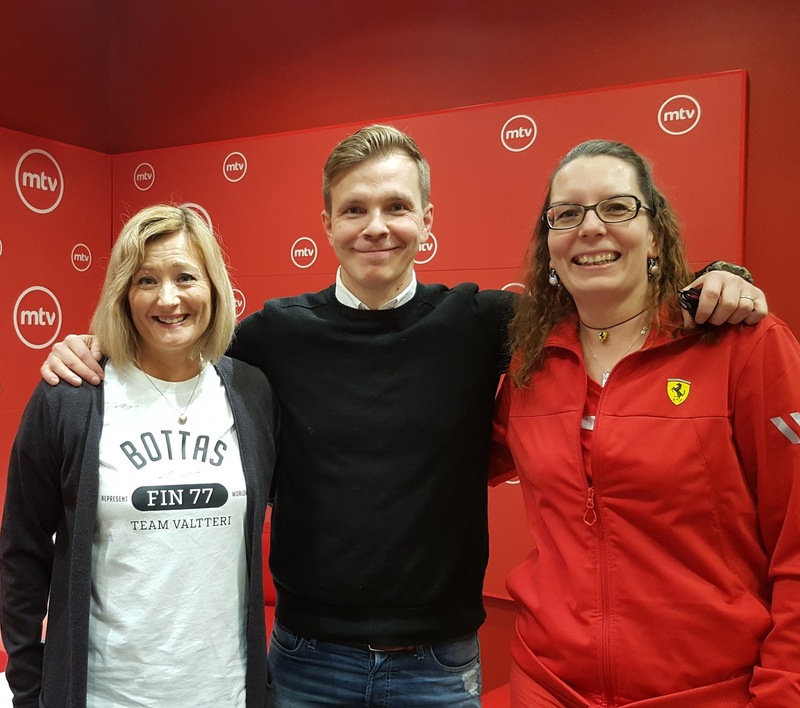 It was a memorable moment to meet the Finnish F1 team and get a live glimpse on how the Formula 1 broadcasts are made. The race start was absolutely electrifying. Sebastian took a staggering start from P2 and snatched the lead! What a perfect move from the German! Bottas was second and his fellow countryman Kimi third. A lot happened on the opening lap. Red Bull´s Ricciardo spun in Turn 2 and dropped down to the back of the pack. Haas´ Magnussen and McLaren´s Vandoorne collided, which ended the race for both of them. Haas teammate Grosjean had a collision with Force India´s Ocon, which lead into the first ever retirement in Ocon´s Formula 1 career. Safety car was deployed. Hamilton had had a stunning opening lap, as the Briton had made it 14th already, having started to the race from the pit lane. The re-start took place on lap 6. Sebastian held on to his lead, with the Finns Bottas and Kimi right behind him. Home hero Massa was driving an excellent race, as the Brazilian made it past McLaren´s Alonso at the re-start, moving 5th already. On flames was also Hamilton, who was absolutely storming through the field. On lap 21 the Briton jumped already 5th, having impressively made it past home favourite Massa. Now the hot question was: would Hamilton be able to make it on the podium? There were 10 seconds to Verstappen´s P4 and 17 seconds to the lead. The top four pitted around lap 30; all of them opted for a fresh set of yellow-marked soft Pirellis. The pecking order remained unchanged after the pit stops. Hamilton was now leading the race, as the Briton had started to the race on the more durable soft rubber, which meant a longer first stint. Sebastian got his lead back, as Hamilton came in on lap 44, switching to the supersoft compound for his last stint. He re-joined the track in P5. Red Bull´s Ricciardo pitted on the very same lap, with a similar tyre strategy. The Australian dropped down to P8 after his second pit stop. Hamilton was absolutely flying on his fresh supersoft tyres. On lap 57 he was already within DRS distance from Verstappen. Usually Max is known to be a very difficult driver to overtake, but this time even Max was toothless against Hamilton´s storming attack. Max was struggling with his worn tyres, and Hamilton made his move a couple of laps later, snatching P4 from the flying Dutchman. With ten laps to go, Max insisted to pit for the second time; the extra pit stop didn´t cost the Red Bull ace any positions, but Max re-joined the track in P5. Kimi was only five seconds ahead of Hamilton in P3. Hamilton smelled Kimi´s blood and began his chase. With six laps to go, the Mercedes ace had closed the gap to the Iceman, which allowed him to use DRS. However, Kimi kept his head cool as ice and blocked Hamilton´s every attempt to try an overtaking move. Kimi´s defensive driving was absolutely brilliant. Sebastian drove to the chequered flag as the race winner, with the Finns Bottas and Räikkönen completing the podium. It was such a pleasure to see both Ferrari aces on the podium! What an absolutely sensational victory for Sebastian; I was so happy for him! Thanks to Kimi´s impressive driving, Hamilton was left in P4. However, starting from the pit lane and making it 4th was an outstanding performance from the newly crowned world champion. Verstappen finished 5th and teammate Ricciardo 6th. Williams´ Massa, who drove his last home Grand Prix, finished an impressive 7th, having made it past McLaren´s Alonso on the final lap. Force India´s Perez and Renault´s Hulkenberg rounded out the top ten. Me and Heli with the Finnish F1 commentator Niki Juusela after the race.